Got some tinned pineapple rings lurking in the fridge? Don’t let them go to waste. 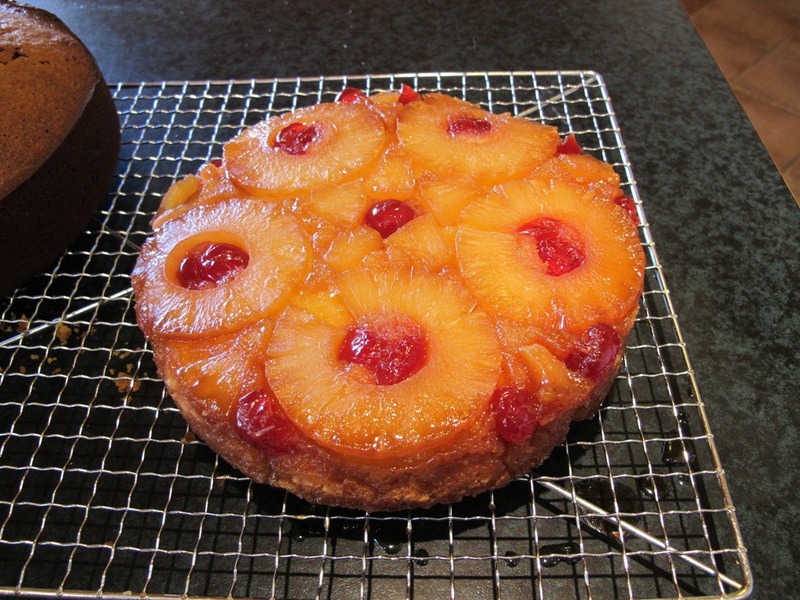 Once I’d formed the pattern for pineapple and cherries over the top, there was still pineapple left over. I decided to chop this up and add it to the butter cake mixture, which would add extra texture and flavour, and the pineapple juice I used instead of milk. If nothing else, it’s a way to make the best of the humble tin of pineapple rings. By all means use fresh pineapple if you are lucky enough to have one, in which case you will need to use milk instead of pineapple juice in the cake batter. Heat oven to 160 degrees C (fan forced). Grease the side of a 20cm round cake tin. To make the topping, cream the butter and brown sugar together and spread over the base of the prepared tin. 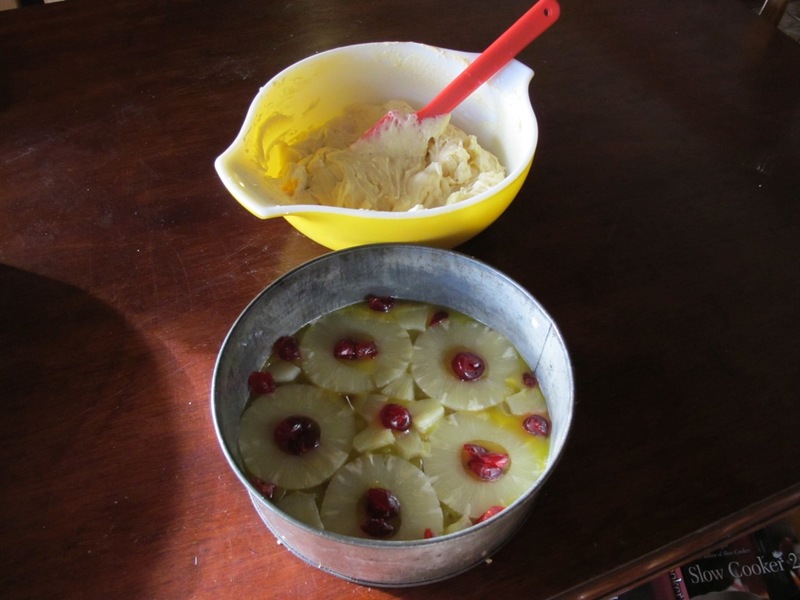 Arrange the pineapple slices and cherries decoratively over the top. Drain any remaining pineapple and also reserve the juice. To make the cake, combine the ingredients, except chopped pineapple, in a bowl and beat with electric beaters for 2 minutes. Fold in the chopped pineapple. Spoon the cake batter over the topping, making the mixture slightly lower in the middle. Bake for 30 minutes or until a metal skewer inserted into the centre comes out clean. Allow to stand in tin before turning out onto a wire rack to cool. Before turning out, if the centre of the cake is risen in the centre, press down lightly. When the cake is turned out, if it wants to split (unlikely but it can happen occasionally), simply place the cake tin back over it for a few minutes until it solidifies.